Where: Started cleaning out my closet today... who knows when I'll finish? jejeje. 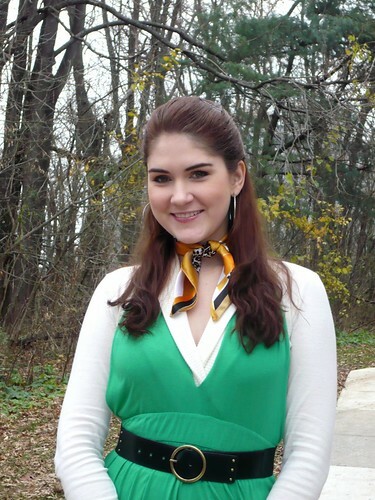 I like my outfit today, but I couldn't help but feel like a leprechaun! Something about the green dress paired with the black belt and the gold buckle... jeje, I didn't realize it till I was already out of the house! lol. Nevertheless, I'm pretty happy with what I came up with. I keep trying to find new ways to make my summer clothes work for fall. I thought the green with black was sorda bla so I added the yellow accesories for interest... jeje little did I know I would end up looking like a leprechaun! jaja. Cute outfit. Love the yellow scarf and bag! Love the fun pops of yellow! You're the sassiest little leprechaun ever! 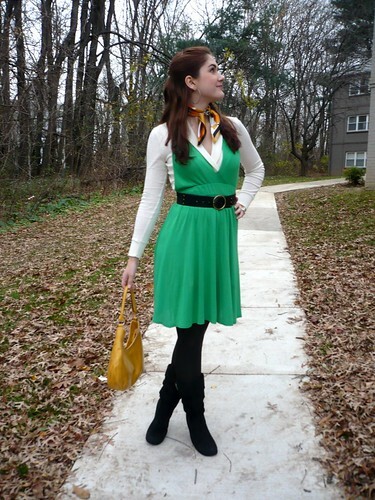 You did a wonderful job extending your summer dress into fall. This is a gorgeous outfit! It is amazing how your are extending your summer clothes into the fall. The dress looks great as a jumper with the sweater underneath. 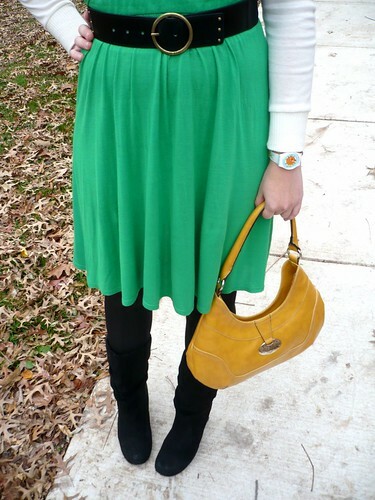 Love the yellow accents in the purse and scarf. Best looking leprechaun I've ever seen. Love the accent of yellow!